Simplify your detailing process with McKee’s! McKee’s 37 Marine & RV Heavy Duty Cleaner Wax is a user-friendly solution to removing moderate oxidation and staining from your boat or RV. 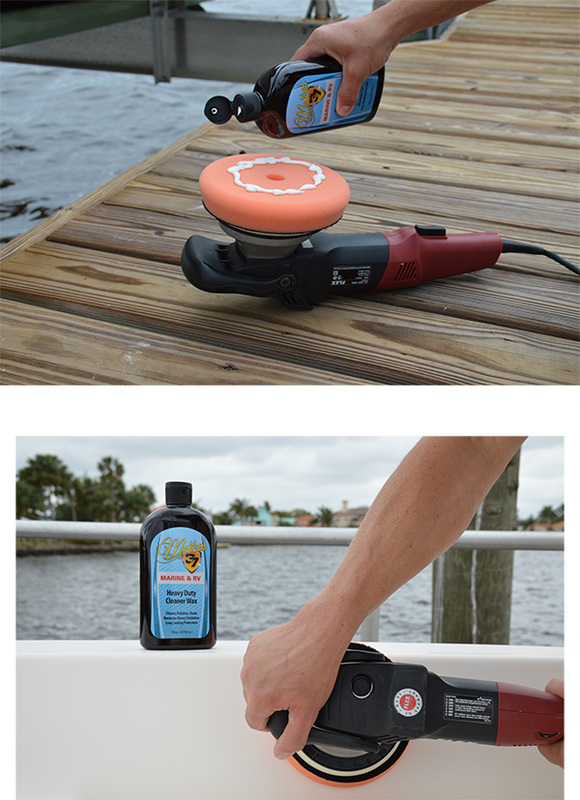 This unique formula combines the cleaning power of a heavy-cut oxidation remover with a durable synthetic wax to minimize the time you spend caring for your boat or RV, and MAXIMIZE the time you spend enjoying it! McKee’s 37 Marine & RV Heavy Duty Cleaner Wax is easy to apply and long lasting making it the obvious choice for your boat or RV. If your boat or RV is suffering from the chalky look caused by oxidation or staining, but you’ve been concerned about the level of effort it may take to correct, then we’ve got the product for you! McKee’s 37 Marine & RV Heavy Duty Cleaner Wax features advanced abrasives and nourishing polishing oils that work in tandem removing the dead, chalky oxidation leaving a smooth glossy surface behind. It even includes a synthetic wax to lock out contaminants and prevent damage from UV rays. McKee’s 37 Marine & RV Heavy Duty Cleaner Wax was formulated in sunny south Florida and as such, its 100% sun-friendly. That means that you can work in direct sunlight and still get great results — with no hazing or decrease in working time! Apply it by hand or with a machine polisher and enjoy the results! McKee's 37 Marine & RV is 100% sun-safe and can be applied even in direct sunlight! 3. Apply a nickel-sized dollop of polish directly onto applicator sponge. 4. Vigorously rub into surface until it turns clear. 5. Buff to a high gloss using a microfiber towel. 2. Apply an X of polish directly onto a foam cutting pad. 3. Spread polish over a 2’ x 2’ area with the machine turned OFF. If using a rotary polisher, set speed between 1200 and 1500 RPM. If using a dual action polisher, set speed between 5000 and 6000 OPM. 5. Remove excess polish using a microfiber towel. McKee's 37 Marine & RV Mildew RemoverMcKee’s 37 Marine & RV Mildew Protectant SprayMcKee’s 37 Marine & RV Water-Resistant Vinyl ProtectantMcKee’s 37 Marine & RV Gloss Enhancing Final PolishMcKee's 37 Marine & RV Hydro Pearl Sio2 CoatingMcKee's 37 Marine & RV Final Step Detail WaxMcKee's 37 Marine & RV All-In-One Fabric & Vinyl CleanerMcKee's 37 Marine & RV Carnauba Wash & WaxMcKee’s 37 Marine & RV Repel Glass & Plastic CleanerMcKee’s 37 Marine & RV All Purpose Surface CleanerMcKee’s 37 Marine & RV Bug Remover & Wax RestorerMcKee’s 37 Marine & RV Vinyl Decal & Graphic RestorerMcKee’s 37 Marine & RV Heavy Cut Oxidation RemoverMcKee’s 37 Marine & RV Carnauba Sealant WaxMcKee’s 37 Marine & RV One-Step Polish & SealantMcKee’s 37 Marine & RV Repel Glass & Plastic Cleaner 128 oz.McKee's 37 Marine & RV Final Step Detail Wax 128 oz.McKee's 37 Marine & RV Carnauba Wash & Wax 128 oz.McKee's 37 Marine & RV All Purpose Surface CleanerMcKee’s 37 Marine & RV Bug Remover & Wax Restorer 128 oz.